What if we are raising our children to succeed in a world that no longer exists? 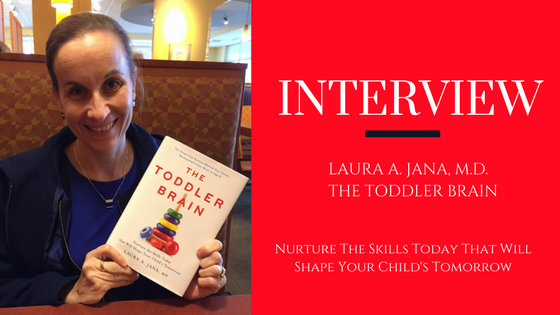 That is the forward-thinking question pediatrician Laura A. Jana, M.D., asks in her new book, The Toddler Brain. Over a cup of coffee, I interviewed her about why she felt compelled to write this new book. I met Dr. Jana 10 years ago when we were looking for childcare for our oldest son. At that time, she owned Primrose School of Legacy, a childcare franchise of Primrose Schools. We were intrigued that a high-level, academic pediatrician would decide to operate a childcare center. After meeting Dr. Jana and learning more about her, it was easy to see why. She was passionate about children and investing in early childhood to encompass the whole child (health, safety, nutrition, education, social and emotional skills). And what better way to impact a child’s life trajectory than in a childcare center where children are the captive audience? Jana’s experience with hundreds of families at Primrose, raising her own three children, attending innovation conferences, TED talks, talking with business leaders, authoring other parenting books, consulting, her role as a pediatrician (the list could go on) has given her unique insight into how our rapidly changing world might impact our children. Everywhere she went everyone seemed to be talking about the same thing. Jana could go to a business summit and hear about the skills the workforce doesn’t have today. Or go to a TED conference and hear the direction the world is moving in. Everyone was talking about these skills and acknowledging that soft, non-cognitive, ‘other’ skills are IMPORTANT! A few years ago, Jana met Reid Hoffman, co-founder of LinkedIn. She explained in the book that as he was writing his book, The Start-Up of You, he had asked Jana to read it and share her thoughts. She told Hoffman that his book read like an insightful parenting book. Only Hoffman wasn’t a parenting expert or a pediatrician. His book’s purpose was to empower readers to become CEO’s of their own careers. The connection between Hoffman’s convictions and Jana’s desire to identify a ‘toolkit’ of necessary skills to succeed was undeniable. How do we raise children, the next generation of our workforce, to have the skills they are going to need to succeed in such a rapidly-changing world? Jana needed a word to describe these non-cognitive, “other” skills. Given how important they are becoming, she wanted something more concrete than “non-IQ” or “soft” skills. That’s where her term ‘QI Skills’ (pronounced “key”) comes in. Beyond being a catchy reversal of I.Q., in Asian language and culture, ‘QI’ is the positive life force or positive energy underlying all living things. She uses the Star Wars reference of the Jedi “force” to describe the term. With three young sons, that’s a reference I can remember! ME – Self management skills that include self-awareness, self-regulation, self-control, attention and focus. WE – The people skills that allow us to understand, share, and play well with others, including the language, empathy, listening, and social-emotional skills necessary for effective communication, collaboration and teamwork. WHY – Skills that include questioning, curiosity and inquisitiveness. These allow us to see the world as a question mark and to strive for a better understanding of how the world works. WILL – Self-motivation and drive and define these critically important skills. WIGGLE – Physical and intellectual restlessness. Jana gave several age-appropriate examples of activities parents can do day-to-day to nurture these skills. Many of the suggested activities have been done for generations — such as cooing, singing, reading and talking to your little one. As an example, a key 21st century skill in the business world is self-management, which fits into the world of “Me” . Applying this to a child’s world, that might mean when a child learns not to bite their friends (impulse control). Or take empathy for example. It means ‘walking in another person’s shoes.’ The world is global and complex with people from different backgrounds and perspectives. For a child, walking in another person’s shoes might mean playing dress up. They are literally walking around in mom’s high-heel shoes and trying to be someone else. You can test social-emotional skills in Kindergarten and have a better predictor of future life outcomes such as jobs, finances, high school graduation, drugs, and teen pregnancy based on these results over the current standardized testing we do. As parents, we want nothing more than to raise healthy, happy and productive children. Our kids are no longer ages birth to five years, but QI Skills don’t stop at age five. We’re constantly on the lookout for opportunities to help our children develop these key (QI!) skills and nurture their budding minds! The Toddler Brain gives us the tools we need to do exactly that. You can order your copy today at Amazon.com. Learn more about Dr. Laura Jana here. Thank you to Dr. Jana for this interview and for all she’s done for children in our community and beyond (including our own kids).